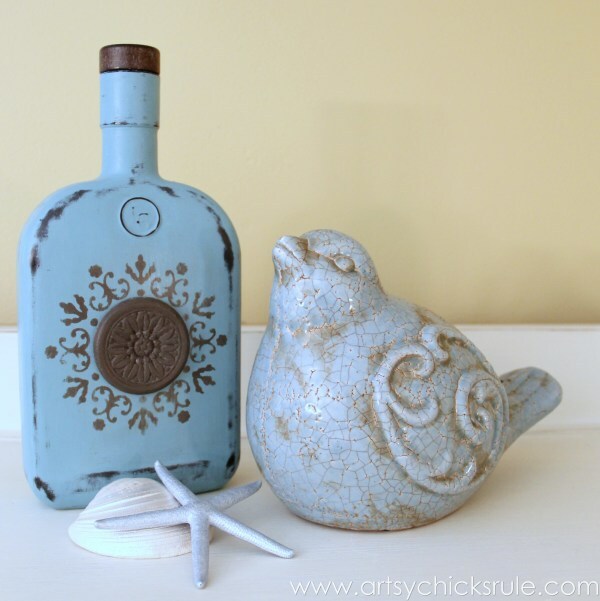 Remember these Chalk Painted bottles (and decoupage) I shared with you all last week? Well, here are the other two I recently completed. Easy does not begin to describe it….silly easy is more like it. 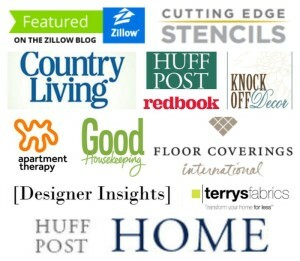 And such great, thrifty, budget friendly home decor. 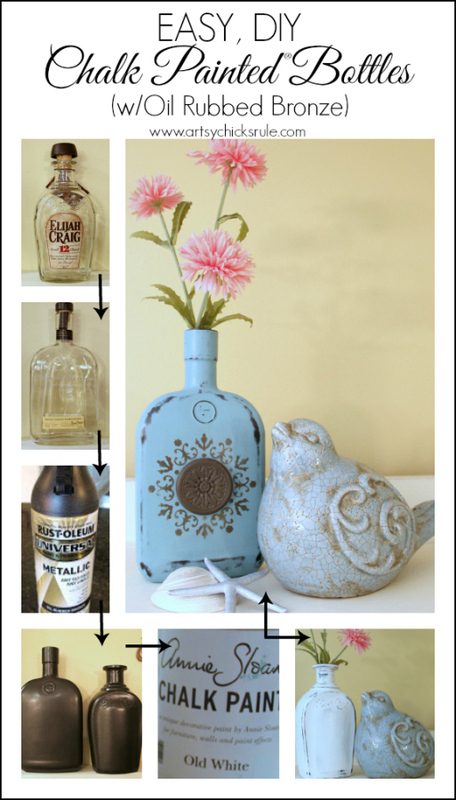 Find some old bottles and remove the labels. 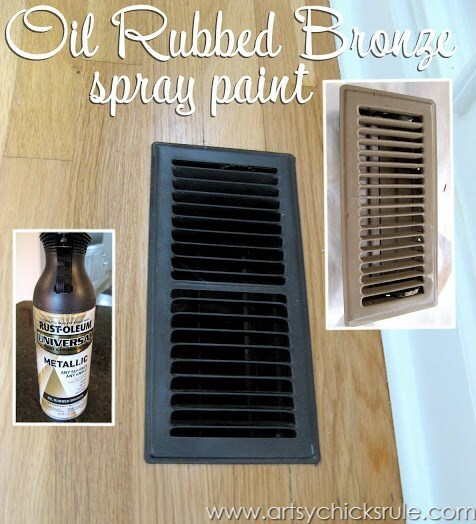 Then dry them well and put a coat or two of Oil Rubbed Bronze spray paint on them. I LOVE this stuff. 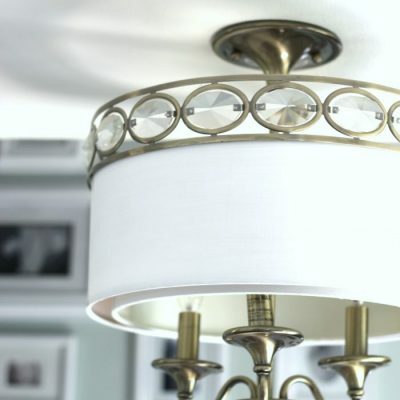 I’ve used it a ton in my home on everything from light fixtures to floor vents. 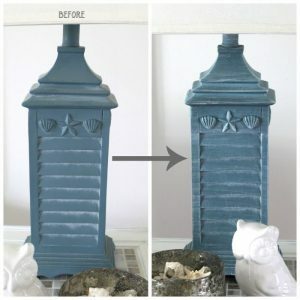 If you want to see what all I’ve painted with it …see this post here–> Many Uses for Rustoleum Oil Rubbed Bronze Spray. 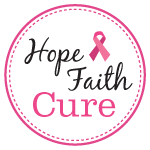 One of my most popular posts ever…and for very good reason! 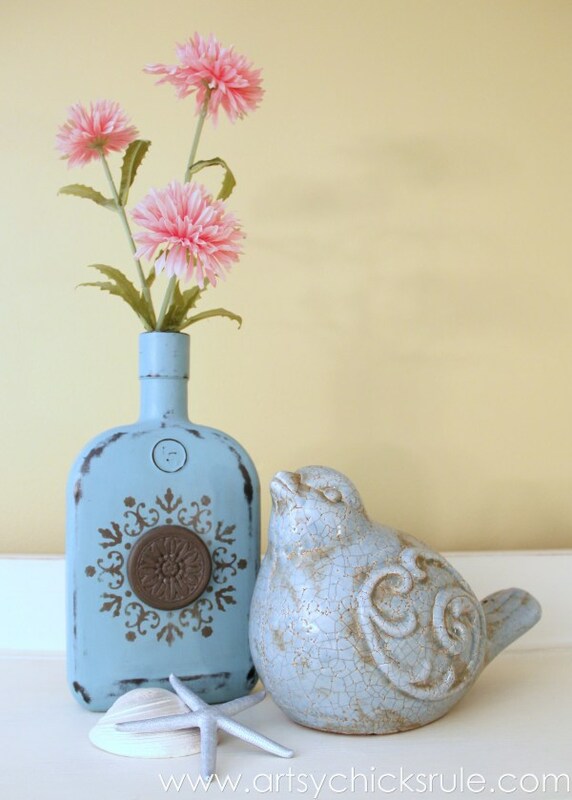 I kind of think these bottles look quite beautiful just like this, don’t you? 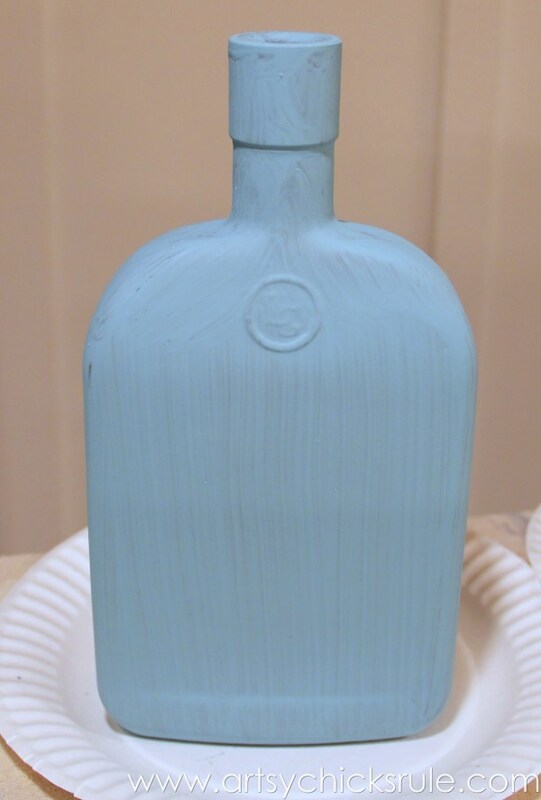 But my intention with the paint was to have a “base” color that was dark to ‘uncover’ when I distress the bottles later. 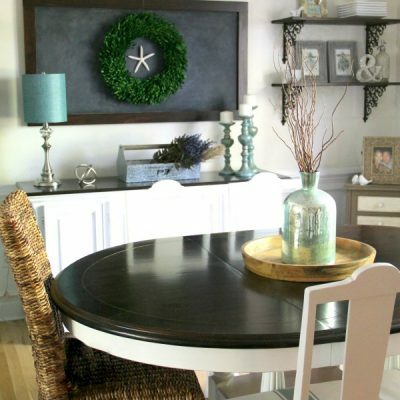 So I proceeded to paint over these with Annie Sloan Chalk Paint®. 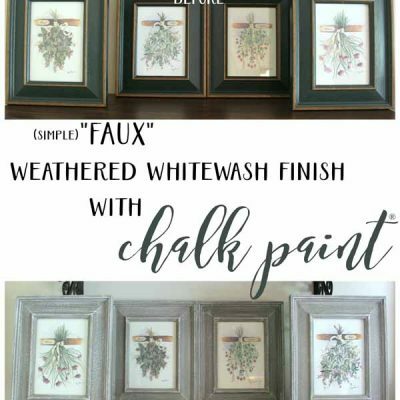 This one got Provence Chalk Paint…. That’s one coat. I did two. 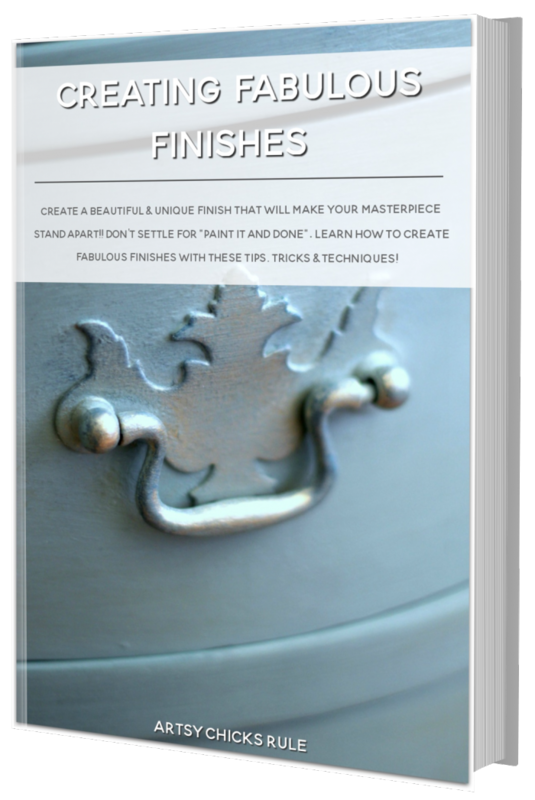 This one got Pure White…..
Once the white one was dry, I lightly distressed to bring the brown of the Oil Rubbed Bronze through. Be careful you don’t go completely through to the clear glass. 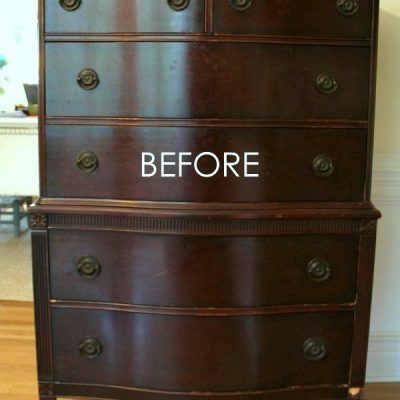 After that I applied one coat of Annie Sloan Clear Wax and buffed. 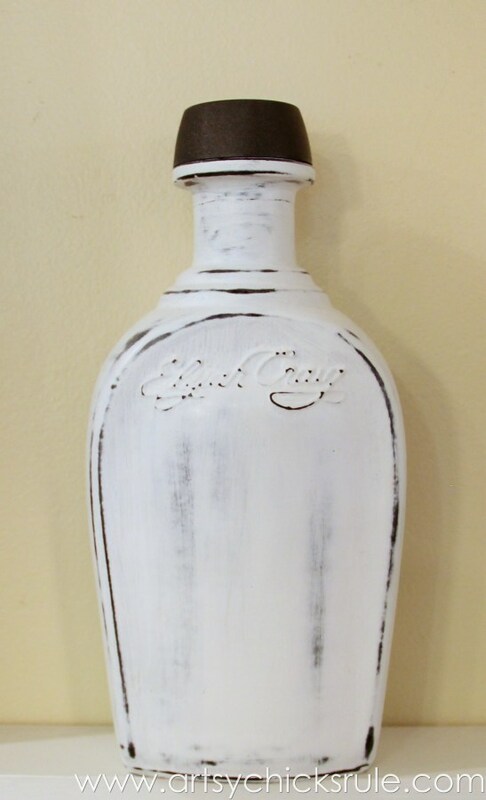 This one had a dark brown/gold plastic corked lid that I sprayed with the Oil Rubbed Bronze. I kept it ORB colored, unpainted. I decided to add a little something-something to the Provence painted one. 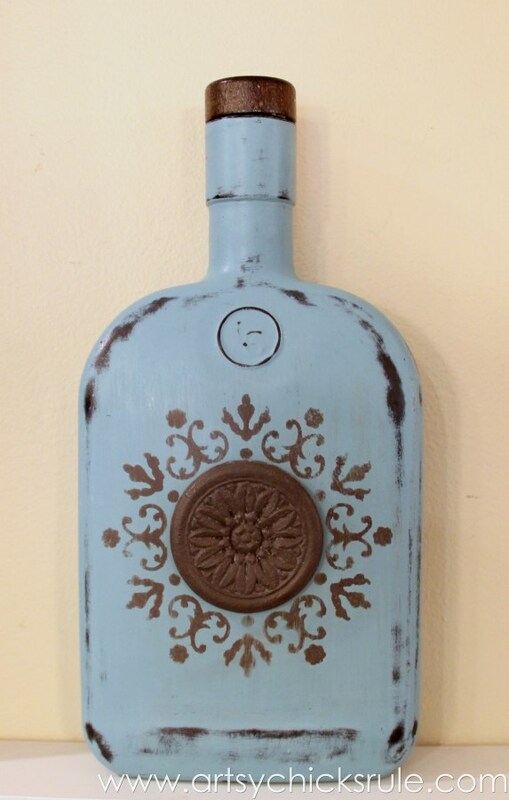 Since it had a flat front I decided to add a stencil in brown Chalk Paint. 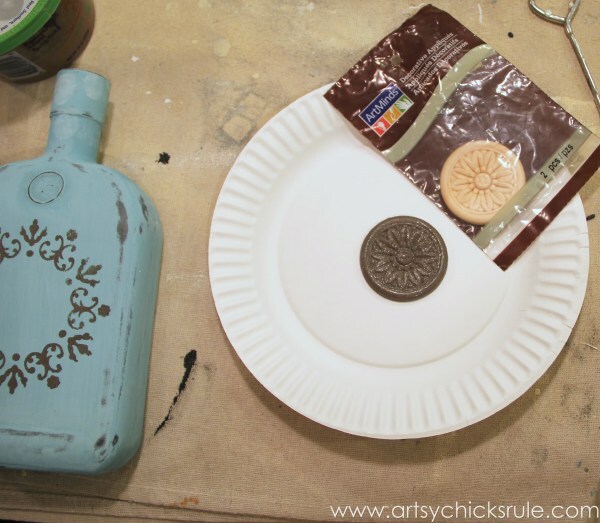 I already had these little wood medallions so painted one up in the brown…. 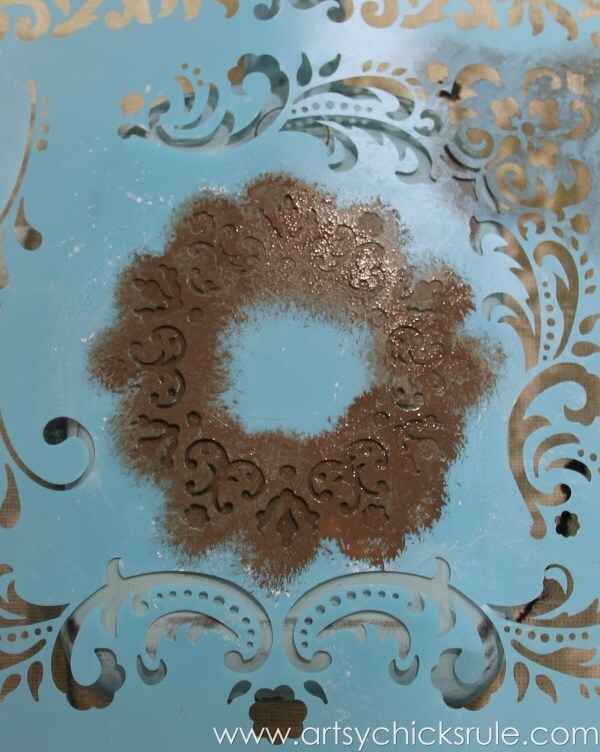 ….and applied it directly into the middle of the stenciled area. Look how perfectly it fit! 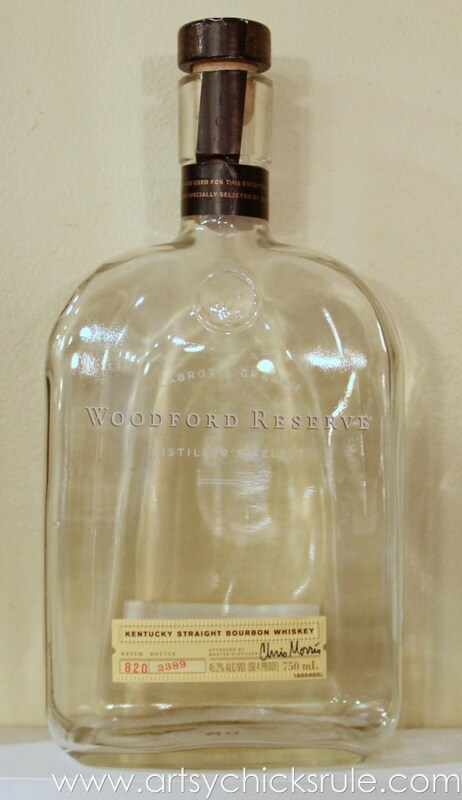 This one had a dark wood corked lid originally….I kept it ‘as is’ because I liked the look. 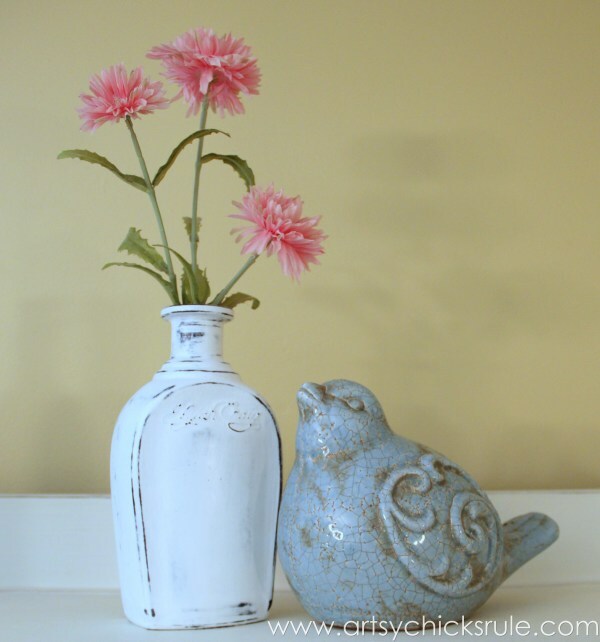 They’d be great as a home decor on a shelf or even as a vase for flowers. These are so easy and fun to do. The possibilities are endless with things like this. 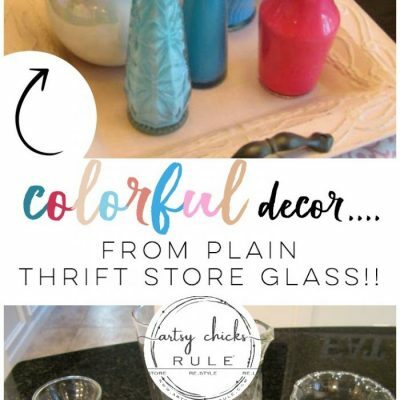 PIN these Chalk Painted Bottles for later!!! This is also a great craft to do with little ones, as a hand made gift or for your very own thrifty home decor. 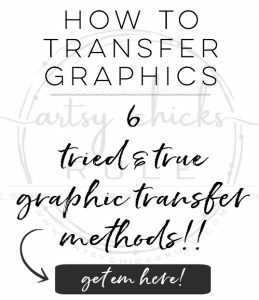 Monograms, other stencils, other colors, techniques, etc. A million and one ideas. 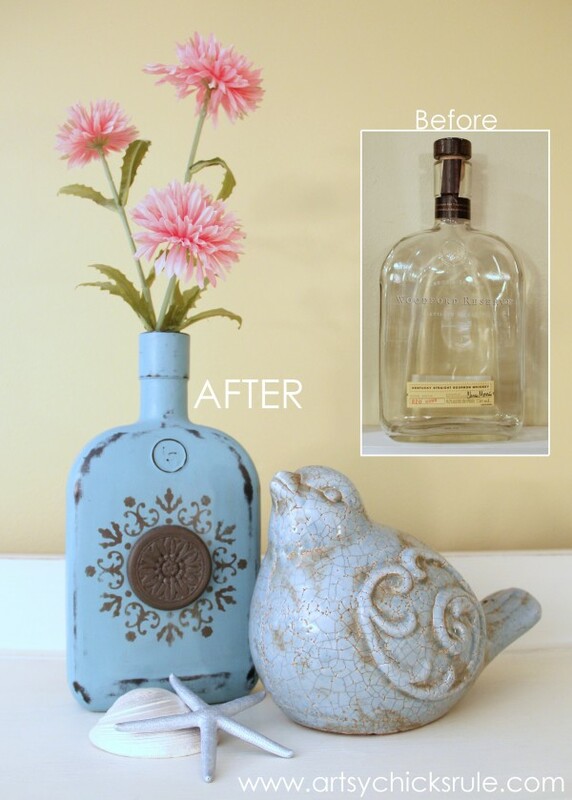 So don’t throw those old bottles out anymore! Thank you Rose :) These were really fun to do! I agree, they do have pretty bottles. 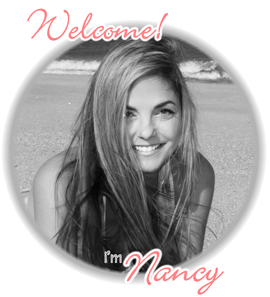 Love how pretty these bottles look Nancy. 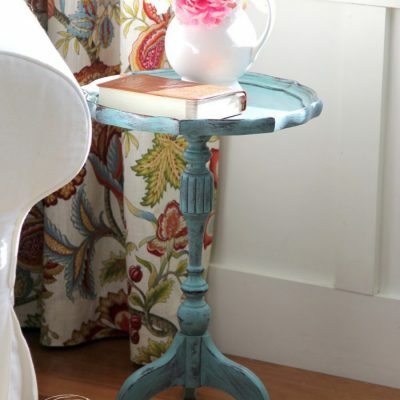 The oil rubbed bronze with provence is stunning especially with the addition of the painted medallion and stencil. 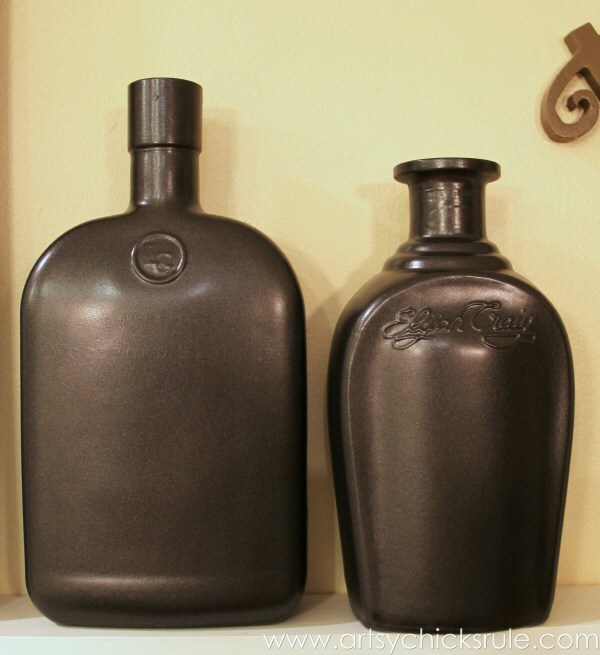 You’d never know these were whiskey bottles! I know, the paint completely changes the look! So adorable! I love your diys :)) Happy Halloween! 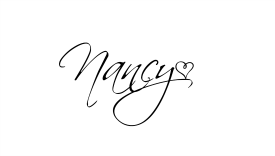 Hi Nancy, it’s been a while for this so don’t know if you’ll see it still but will try. 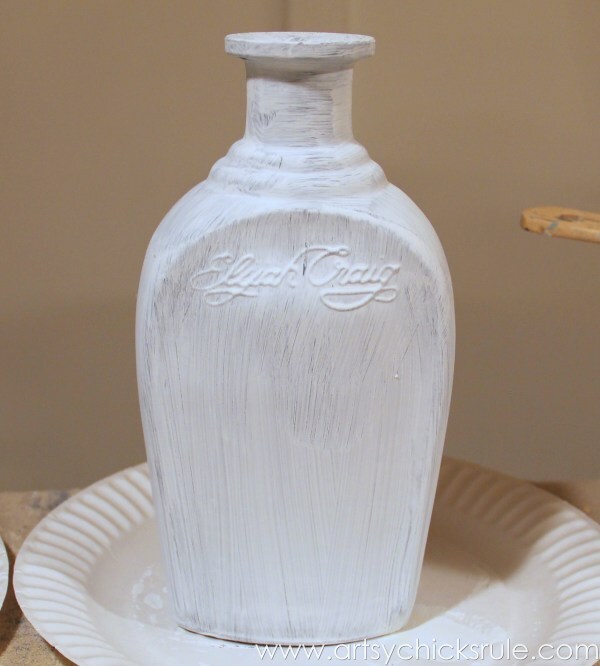 I tried using the oil rubbed bronze which I LOVE…….on a bottle then painted with chalk paint. I don’t know if I didn’t let all dry long enough in between coats or what (I’m very impatient) but mine cracked all up. Like, it’s literally crackled looking!! Yuck!!!! Can you tell me if you think that’s why it could have happened as well?? Any advice would be greatly appreciated. Thank you! Love the one with the medallion & stencil. 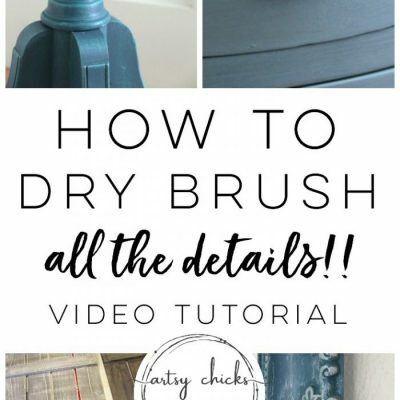 Can you tell me how you made the stencil and what you use to distress with. I didn’t make the stencil, I think that one came from Michael’s. 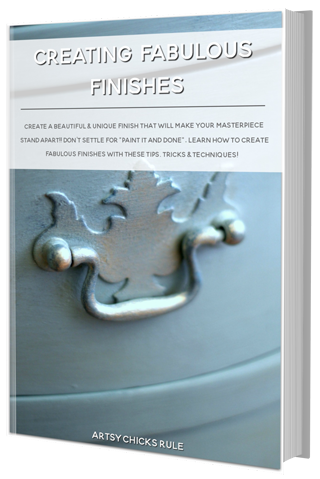 I usually use a very fine piece of sandpaper and lightly go over the edges to soften/give wear. Love this. 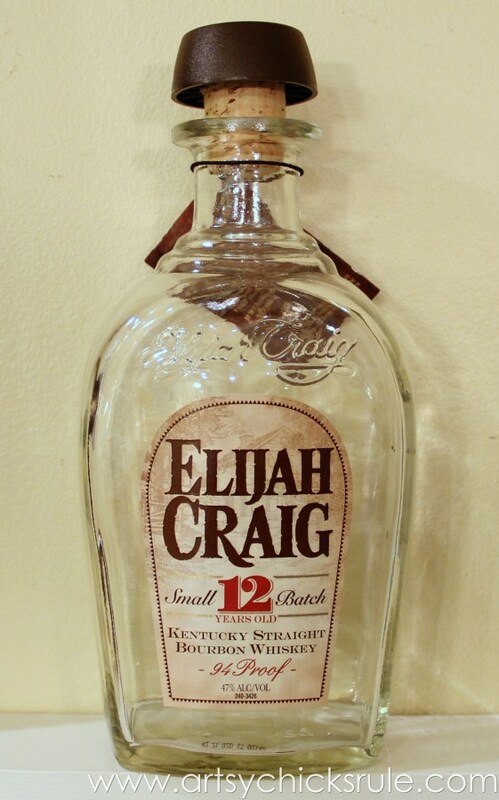 Just started saving hubby’s bourbon bottles ‘cuz they are beautifully shaped. I love your projects and often print them out to save for future reference. Wish you could provide a format just for printing that created a compact printout (or did I miss a print button somewhere?). If I copy this right from the website, it’s 34 pages long. Keep up the good work.